There is something about New Year, people either loathe it or love it. 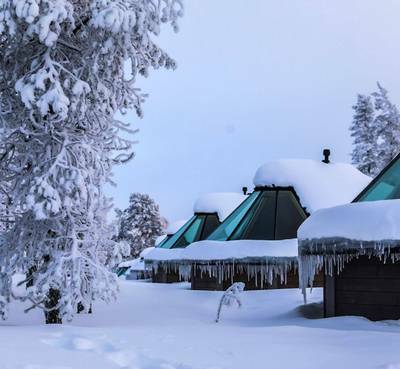 Whichever camp you are in, this holiday is sure to delight you as it provides an escape from the normal New Year; either allowing a new perspective on the event or providing a fabulous new way in which to spend it. 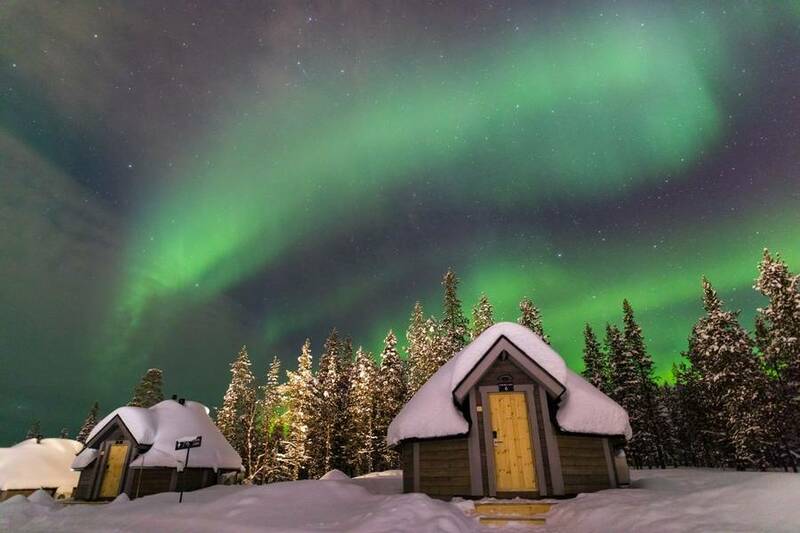 The Northern Lights Village is the only destination where Aurora accommodation is included as standard and the guides here have an incredible passion for hunting down light shows. 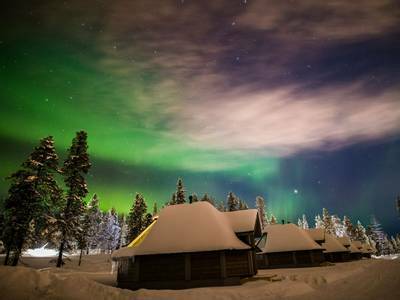 So, if you want to try and witness the Northern Lights at New Year, this four-night holiday is a great option. 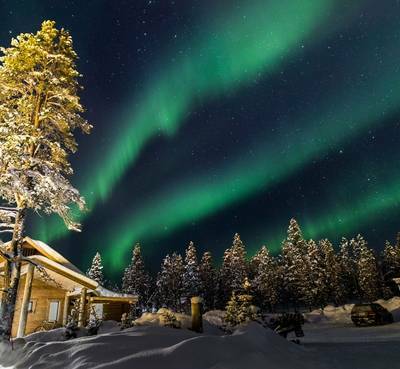 Kick start your New Year with an Aurora hunting holiday in Saariselka, Finnish Lapland. 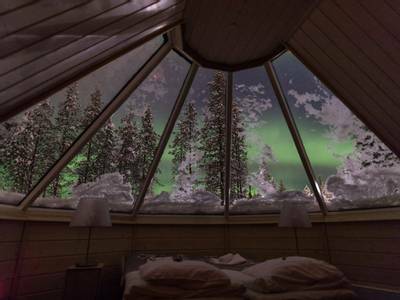 During this four-night break, you’ll stay in an amazing glass-roofed Aurora Cabin and take part in three dedicated Aurora hunts. 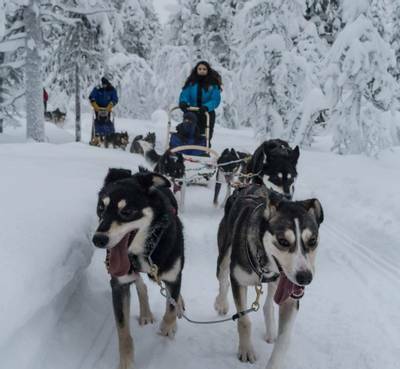 There are also brilliant daytime experiences such as dog sledding and snowmobiling included. *If you arrive late in the evening on day one, the hotel will provide you with a light dinner. 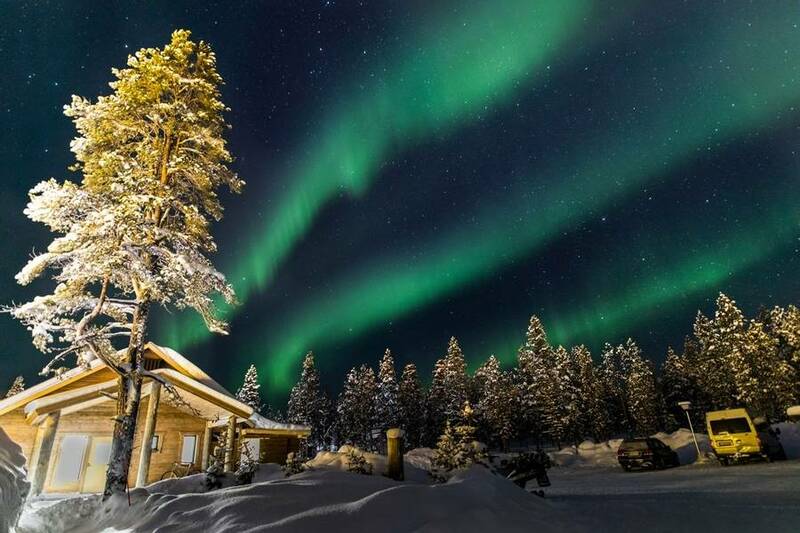 The Northern Lights Village sits on the outskirts of Saariselka in North East Finland. 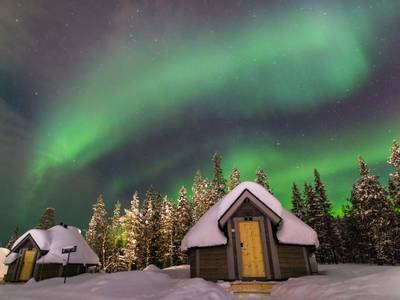 Sheltered from the light pollution of the town and tucked amongst the trees, the village is an ideal base for those wanting to spend New Year looking for the Northern Lights. 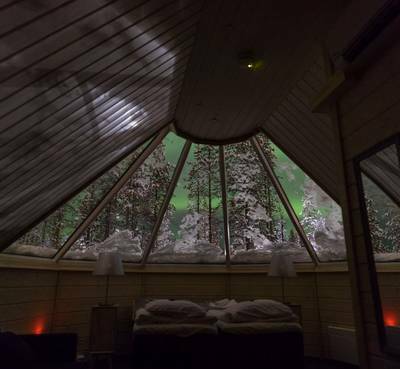 The Aurora Cabins will be your base for the whole of your stay and these partially glass-roofed structures allow you to watch the northern skies from the comfort of your very own bed. 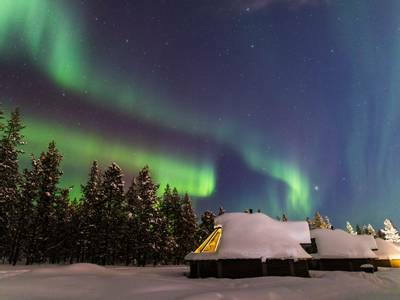 Couple this Aurora accommodation with three dedicated Northern Lights hunts and you have the makings of a fabulous Aurora adventure. In the company of experts, you will spend three evenings in search of the lights. 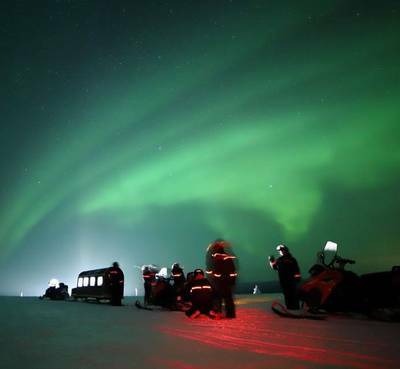 The activities typically kick-off with an Aurora workshop which will give you a grounding in Aurora science. 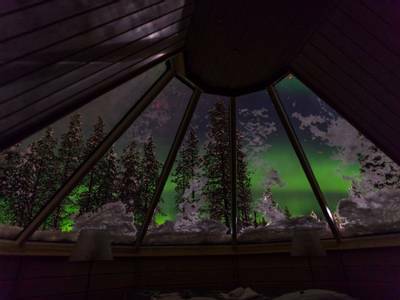 The guides here are keen photographers and so hints and tips on how to capture the Northern Lights on camera will also be provided. You can rent photography equipment locally. 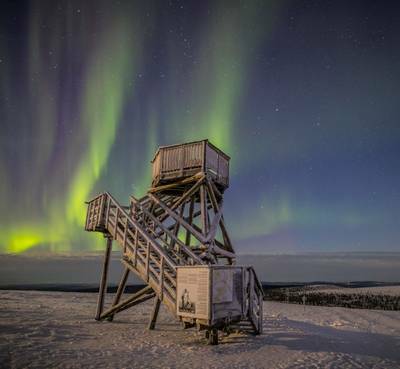 Next is a ride in a snowmobile-pulled sleigh which is towed behind your guide’s snowmobile – this is a gentle way to be introduced to the Arctic at night and a fabulous away to hunt for the lights. 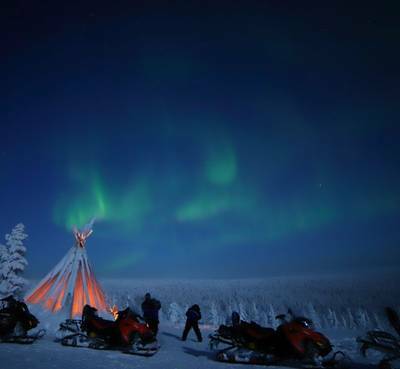 During the day, the blue light of deep winter offers a unique perspective on the landscape and you will enjoy some traditional Arctic activities. At this time of year the sun does not appear above the horizon and so the dusky light during the middle of the day provides around four hours of light (please note that some activities may start/end after dark as a result). Meeting a reindeer herder and their animals is a real pleasure and a sleigh ride is always memorable. Next on the agenda is a snowmobile and ice fishing tour which introduces some of the most popular local activities. 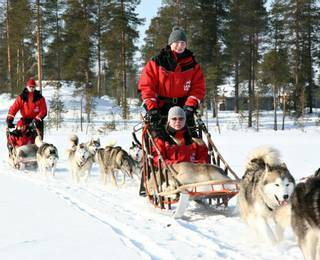 For many people though, the highlight will be the dog sled safari which offers a taste of this incredible mode of transport. 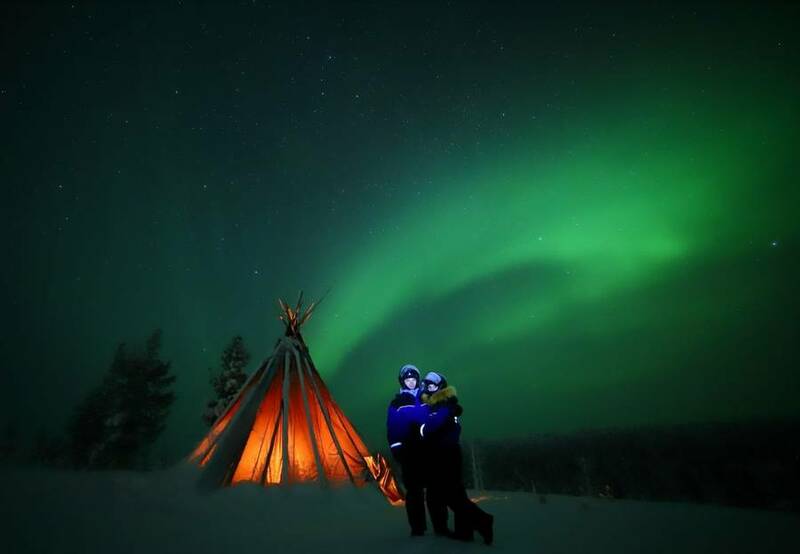 On New Year’s Eve there will be some wonderful celebrations at the Northern Lights Village and if the Aurora are dancing overhead when the clock strikes Midnight, it will be an unforgettable way to see in the New Year. 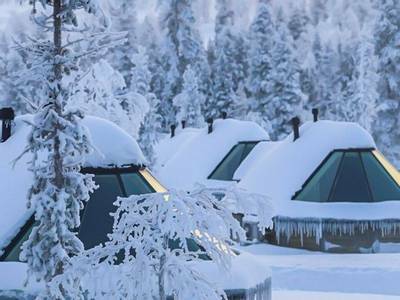 You will arrive at Ivalo Airport today and a driver will be waiting to transfer you to the Northern Lights Village. Your Aurora accommodation will be ready for you to settle into. Depending on what time you arrive, you will either have dinner in the main restaurant or a smaller dinner provided to you in the restaurant outside of their usual opening hours. 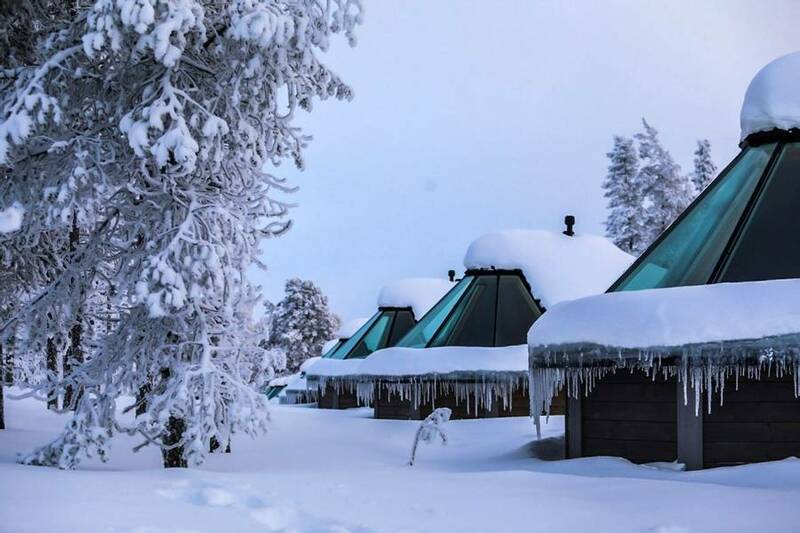 Reindeer are synonymous with Lapland and an encounter with them is practically mandatory. 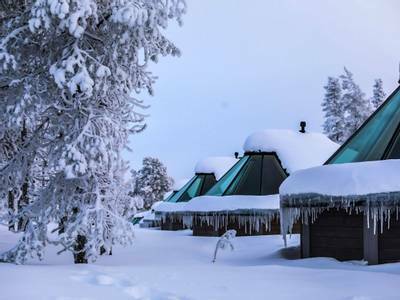 Your guide will introduce you to the animals and shall provide an insight into how the reindeer and their herders survive the long winters and keep this age-old way of life alive. The reindeer paddock is situated in the village and here you will see the animals up close and will be able to feed them. There will then be the chance for you to enjoy a short reindeer-pulled sleigh ride as part of the experience. Lunch will be served in a warm kota (traditional teepee) at the Northern Lights Village and with this included, the activity will last between three and four hours. 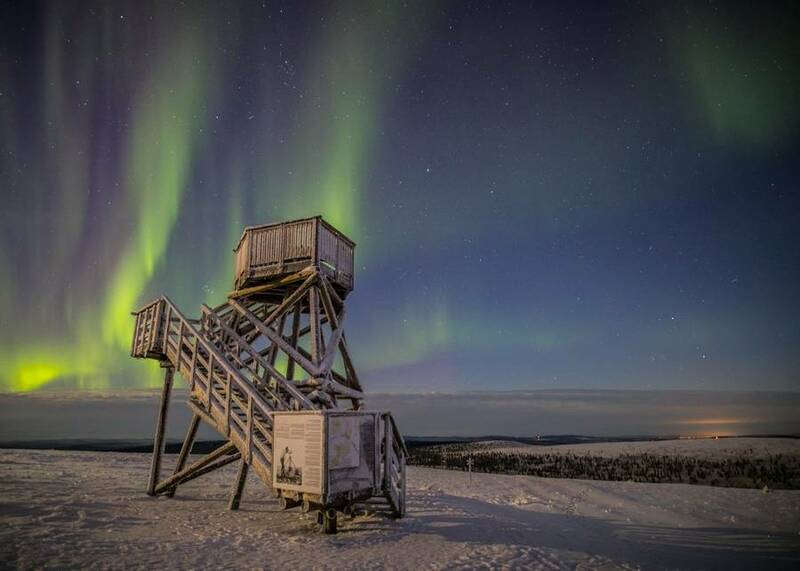 This afternoon, you will enjoy an Aurora Workshop with an expert guide. 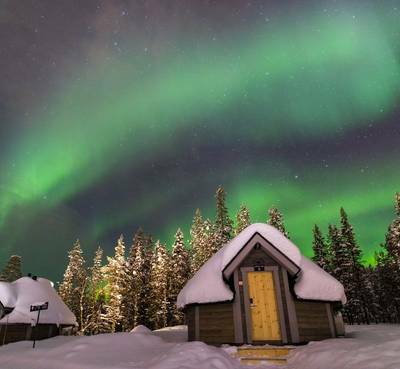 Your host will give you hints and tips on how to capture the Northern Lights on camera. If you do not have a camera such as a DSLR then they are available to hire locally. Tonight is, of course, New Year’s Eve and the Northern Lights Village will host a special evening meal with some local specialities. There will also be a firework display to mark the end of the year. Fingers crossed, the Northern Lights may join in the fun. Following the celebrations, your guide will lead you on your inaugural hunt by snowmobile-pulled sled. You’ll break to enjoy hot drinks by a fire and listen to local stories told by your guide as you eagerly await a potential display. The anticipation felt during the hunt is part of the enjoyment, and with a little luck, the conditions will be promising for you tonight. You will be out for around three hours in total. After breakfast today, you are in for a real treat. 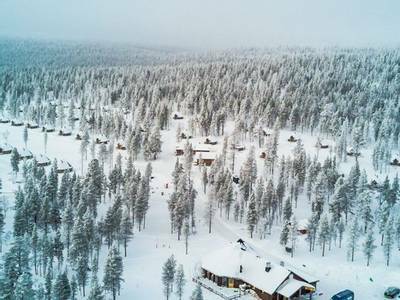 Your guide will be leading you on an activity which combines two of the most popular pastimes in Lapland – snowmobiling and ice fishing. After full instruction and a safety briefing, you will ride your snowmobiles through the forest and out to a nearby frozen lake. Travelling two per machine, you can swap drivers should you wish at the halfway point (you must be over 18 and hold a full driving licence to drive a snowmobile). At the lake, your guide will help you drill a hole through the thick ice and you will drop your line into the icy water below. This can be a game of patience but if you are lucky you might land a perch or perhaps a local Inari whitefish. Whilst you focus on the fishing, your guide will build a fire and you will enjoy lunch in the wilds (weather permitting) before heading back on the snowmobiles. You will be out for around four hours in total today. During your free time this afternoon you may like to include additional activities which can be found in the ‘Personalise’ section of the holiday page. 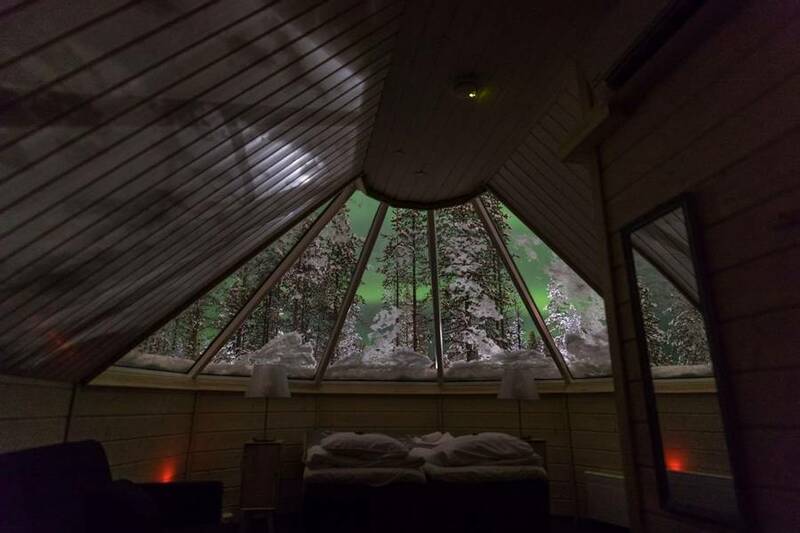 After dinner at the hotel tonight, it’s time for an evening of Aurora hunting. 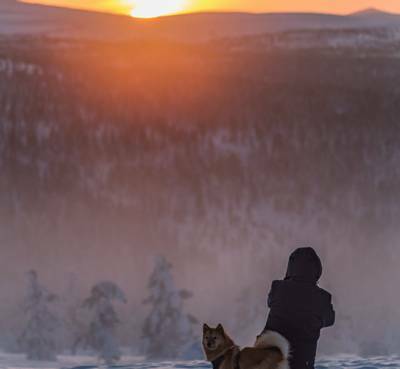 Lasting around three hours in total, it begins with a bus journey north to Lake Inari. 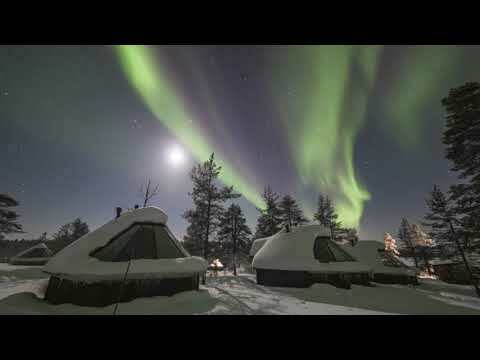 The guides have a selection of camps set up on the lake shore and each is in a prime Aurora viewpoint. 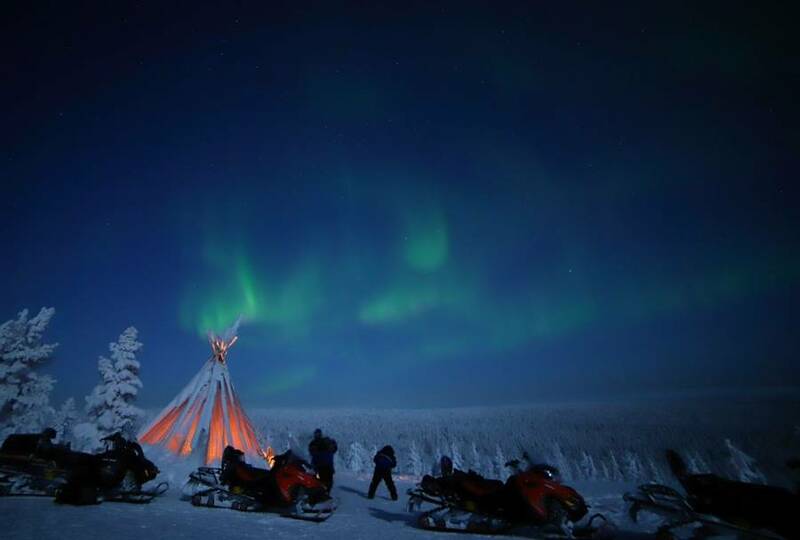 At the chosen camp, a fire will be lit, and warm drinks and snacks will be shared as you commence your Aurora stake-out. With a little luck and the right conditions, your patience will hopefully be rewarded with a display. 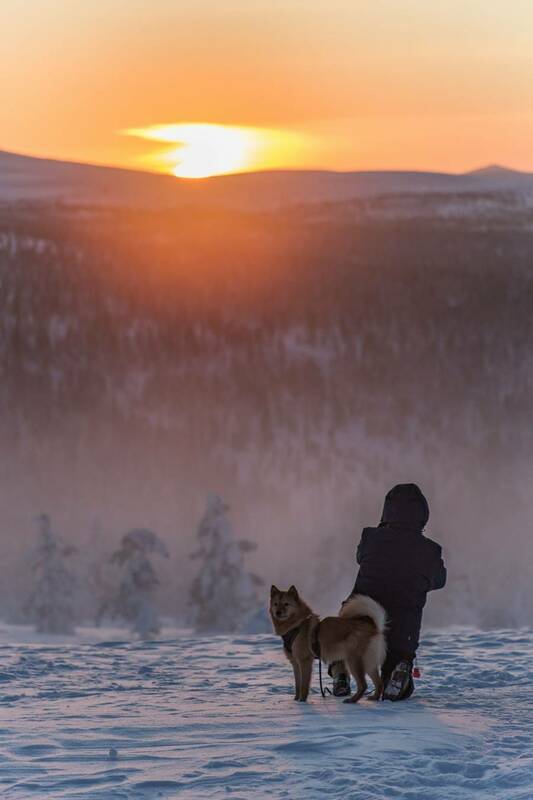 A dog sled safari is often a highlight for guests in Lapland and today you will have the chance to experience it for yourself. After transferring you will meet the dogs - they will demonstrate their enthusiasm for the trail with a pretty deafening display of howling and barks when you arrive – they just love to run and their excitement overflows when guests get ready to take them out. You will, however, notice that when the sleds’ runners begin to move, all the dogs will fall silent and focus on the task at hand. 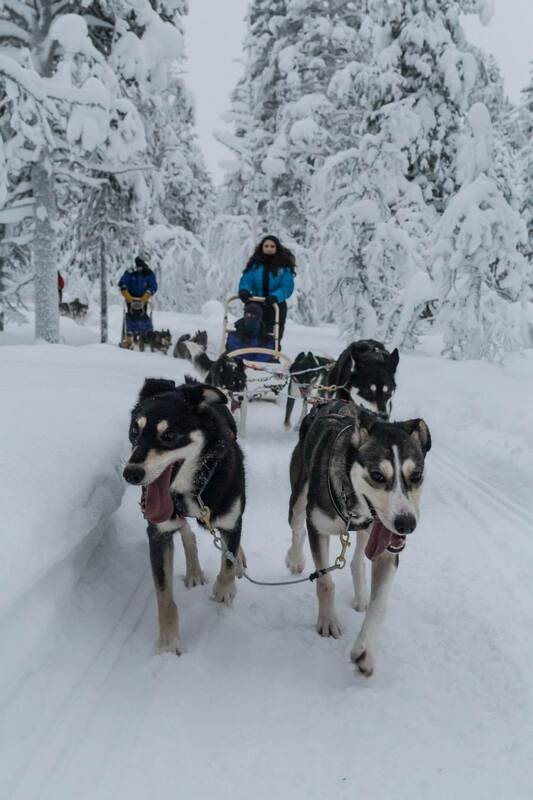 We include an excursion which is around two and a half hours long (including a break for hot drinks, transfers and training) in total and includes around one to one and a half hours of dog sledding depending on the conditions. You shall cover around 10km during the safari. You can, however, upgrade to a longer experience should you wish to do so and the details of the options available can be found in the ‘Personalise’ section of the holiday page. All safaris are two people per sled as standard and full instruction will be provided before you take control of the teams. You can switch drivers should you wish to do so. After your adventurous morning, lunch will be served at the restaurant back at the Northern Lights Village. 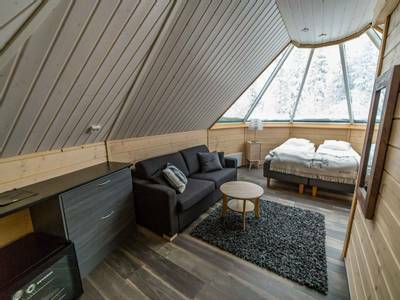 Your afternoon is your own and so you may wish to include additional activities or perhaps explore the town of Saariselkä which is within walking distance. There are plenty of shops to keep you busy and downhill skiing is also an option. 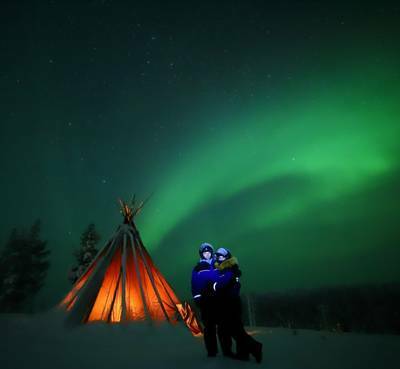 Your final Aurora hunting activity is one of the most thrilling. 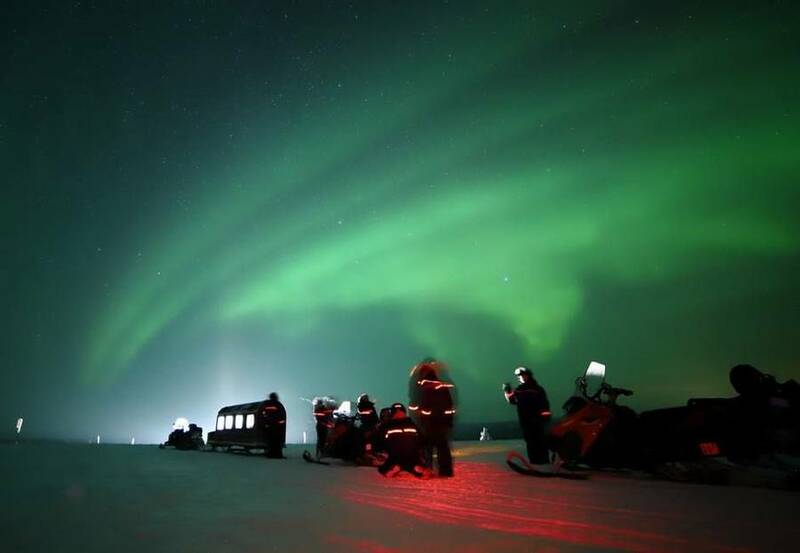 You will be back on snowmobiles tonight, using them to hopefully track down an Aurora display. This experience is very different as only your headlights illuminate the dark forest and you really get a sense of the wilderness which surrounds you. Winding your way through the forests you will climb to the top of one of the fells where the views of the night sky are stunning. Your guide will light a fire as you wait in the wilds for a potential display to come and mark your final night in Lapland. Following breakfast, it will be time to leave the Northern Lights Village behind. As you are departing on an early flight, a packed breakfast will be provided for you to take with you on your transfer.